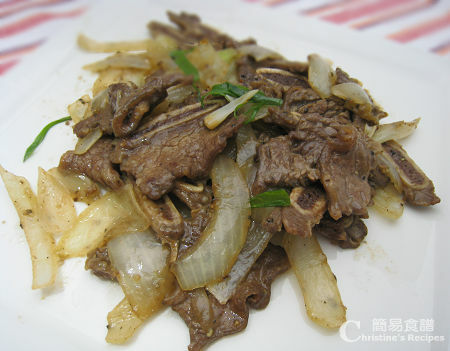 Many of my friends like to order this Beef Short Ribs with Black Pepper in Chinese restaurants. The cooking method of beef short ribs is quite unique and new to my Aussie friends. They used to have grilled or baked short ribs that need thicker cuts of course. As for this Chinese stir-fried dish, the thinner the short ribs you use, the better result you’d get. Yet it could be quite hard to find beef short ribs in thin cuts at any supermarkets here, as they might only offer thicker cuts for BBQ or bakery. Then you have to ask the butcher at supermarkets to slice short ribs as thin as you would like if you really want to cook this dish. If you are living in Hong Kong or other Asian regions, you might not have the problem of getting the right thickness of short ribs of course. 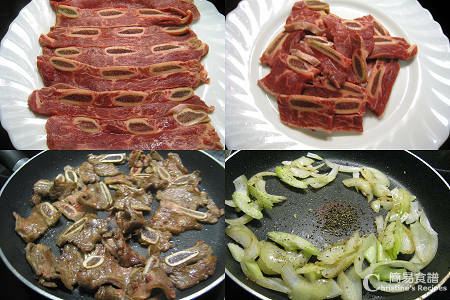 To save time and energy to ask for a favour, I found some short ribs from a Korean shop, that were cut for Korean BBQ. They are perfect in size and quality to use in cooking this dish. If you don't like any bones, just buy the quality veal, thinly sliced. It's also awesome in taste. Rinse short ribs and wipe them dry. Cut into about 2.5cm (1 inch) in length. Blend in marinade for 15 minutes. Heat oil in a frypan over high heat until lightly brown, about 80% done. Make sure to fry briefly in one single layer, not letting them overlap. Set aside, covered. Heat some oil and sauté onion over medium heat until translucent. Add celery, continue to cook for 3 minutes. Push onion and celery to sides of pan. Add a dash of oil to sauté black pepper, garlic and shallot in the center until aromatic. Stir and combine onion and celery. Pour chicken stock and continue to cook until onion softens. When sauce dries up a bit, toss back short ribs. Turn to high heat. Add thickening, stir quickly and combine well. Cook consistency to your preference. Dish up and enjoy. looks quite tasty! i love short ribs! These sound delicious! Good tips about the cut of the short ribs. I always got a chance to eat this in my Korean friend home. Yours definitely looks delicious. I just found your blog and love it! I've been looking for recipes like the ones you have here for a while! I like short ribs and I braise them all the time. This is a easier way! another wonderful dish to check out, and as I live near many Asian butchers, I should be able to get the right thickness. I cannot wait to give it a try. It looks and sounds so yummy. Looks so inviting! Too bad I don't take beef but I would love to try it on chicken meat! I like peppery beef, but haven't tried to cook with veal ribs...gotta make it sometime. This looks like a fabulous dish! So flavorful and savory! Hi, i was wondering if we could use another type of soy sauce if we dont have those mentioned to avail? The light soy sauce is the best used for cooking Chinese dishes as the colour is not too dark. There are many brands you can choose anyway.